Our business is to ensure that you remain a valued customer and our products remain outstanding and reliable. FCCAM as Maryborough’s local representative has both the experience and knowledge to know the outdoor trade whether you are a homeowner, gardening contractor or forestry industry, you can rely on our professional advice. We share the interest that the tools you use also are the tools best suited for your particular work. Again, our local representatives are the ones best suited to handle this – they have the special training, skills, tools and resources to handle all Husqvarna machines. After all, they are Servicing dealers, with service as a hallmark. A machine is only as good as the service it gets. With the right maintenance and parts, it will continue to deliver optimum performance for its entire working life. Our products are rigorously tested to ensure that they are reliable at purchase and maintained to that level with proper servicing. Using the right parts mean your equipment performs safely, reliably and economically in the long run. 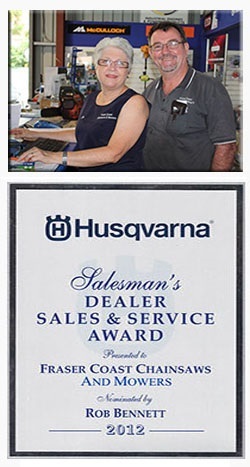 In other words, Genuine Husqvarna Service and Parts allow you to get the most out of your Husqvarna.